A couple of weeks ago it was highlighted that, not for the first time, Melbourne Zoo is seeking an additional one thousand public car spaces. 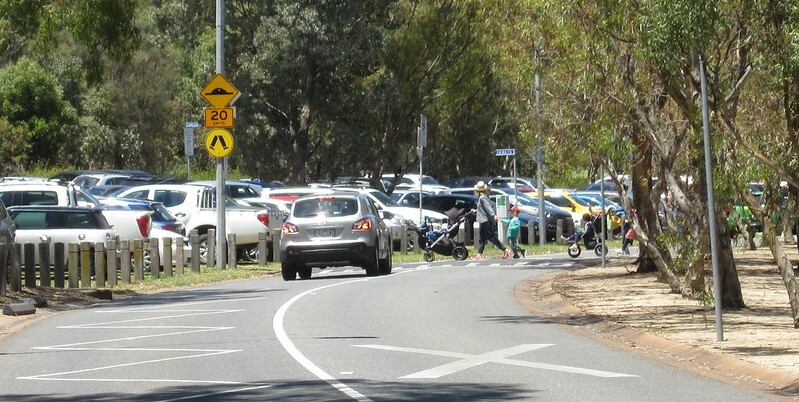 It seems they want to turn Royal Park into Royal Car Park. For an organisation dedicated to animals, you’d think they’d understand the importance of the natural environment. They seem pretty keen to cover the Park in concrete and asphalt. Okay, so they’d like to make it easier for more people to get to the Zoo. But bringing them by car, to a prized park in the inner-city, should be the least preferred option. While the Zoo is served by a train line and two tram lines, they leave a lot to be desired. So rather than pave paradise, there are numerous things that could help people get there without driving. Car parking at the Zoo is ridiculously cheap. As highlighted in The Age’s article, it’s only $2 for up to five hours, making it some of the cheapest paid parking anywhere in inner Melbourne. Apparently on no less than 93 days per year the car park reaches capacity. National Zoo, Canberra seems to be the only one where parking is free… but then, it does seem to be outside Canberra’s built-up area, so presumably land is plentiful. Increasing the $2 parking fee is not unreasonable (remembering admission is $32.50). It could reduce demand, make other modes more cost-competitive, help bring down the admission price, or fund improvements. The Upfield line only runs about every 20 minutes, including peak hours. On Sunday mornings before 10am it’s only every 40 minutes. Given the Zoo opens at 9am, this is hopeless, especially given most suburban visitors will be connecting from other lines. Long waits for connections is a great way to ensure the train doesn’t get repeat customers. How about running the trains more frequently? The single track at the northern end of the line is an issue, but it can be done at least as far out as Coburg. Trains every 10 minutes on this line has been done before – as recently as 2006 for the Commonwealth Games, to help get people to and from venues at… Royal Park. Step off a train at Royal Park platform 2 (from the city), and exit the station. Where’s the Zoo? You can’t actually see it, and the only wayfinding sign present doesn’t point you towards it. If you counter-intuitively look at the other side of this sign, then there’s an arrow pointing you in the right direction. When I was there looking around, I actually saw people off the train looking for the Zoo, and was able to help them. If you can find the way, from the station to the Zoo entrance is only a short walk. But you have to cross a road. There’s not much traffic, but I saw families head across without looking. One group realised halfway across that a vehicle was coming, and stopped in the middle of the road to let it pass. The very least they could do is put a crossing here to make it easier and safer. Ideally a zebra crossing, but that might cause issues due to the boom gates being so close; it might have to be a signalised crossing synchronised with the level crossing. If so, it should have a very quick response time. While people using the train get no help to cross the road, in contrast there are zebra crossings further along the same road… to help people coming from the car parks. I mean, come on. Route 55 passes right by the Zoo. Route 19 passes nearby on Royal Parade, though it’s a bit of a walk from the stop — about 600 metres. Just like in the hospital precinct, both tram services lack accessibility, important for those with mobility aids/wheelchairs, but also prams. Route 19 has low-floor trams, but no platform stops nearby. 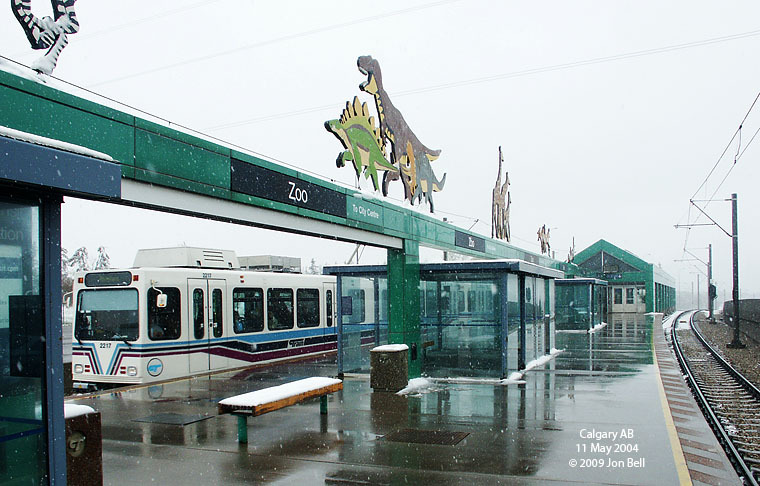 Route 55 has platform stops adjacent to the Zoo, but runs all high-floor trams. The plan to merge routes 8 and 55 should fix this by providing at least some low-floor trams onto route 55, though there are as-yet no platform stops along that route within the CBD. Local bus route 505 runs via the Zoo, between Moonee Ponds and Melbourne University. But it’s very infrequent; only every 40-60 minutes on weekdays; every 60 minutes on weekends, so it’s not very useful. 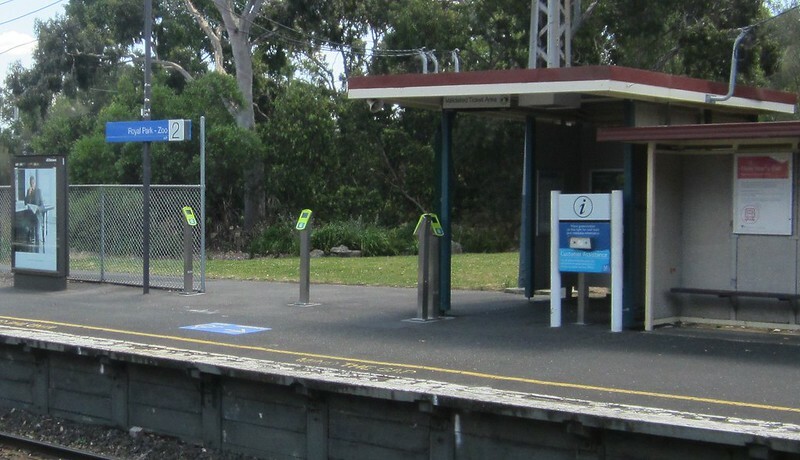 The stops aren’t ideally-placed; the one closest to the Zoo entrance is by the railway station (so suffers similar access issues to the station), the other stop which is actually called “Melbourne Zoo” is poorly placed for both Zoo entrances. Given you might be trying to attract occasional users travelling in family groups, it might also pay to have some kind of joint ticketing deal, or group travel offer, with public transport users able to pay for Zoo entry at their local station and bypass the admission queues. This type of arrangement helps attract people heading to the Royal Show, for instance. The only real-time information in the vicinity is in the railway station. At the exit to platform one there’s a display telling you… how long until the next tram. This is part of a program to assist connections between trains and trams. In principle it’s a great idea, though in this case, I wonder if the potential for connections from inbound trains to trams is a bit limited. Anyway, putting Passenger Information Displays in the station for train departures would be an obvious upgrade (and one that has been done at many stations around the network recently). So let’s summarise: if the Zoo wants to make it easier for people to get there, there are things they can work with appropriate authorities to improve the non-car modes, rather than spend tens of thousands of dollars per space to cover more of the park in asphalt. Likewise, lobby the government to improve tram services and provide accessible stops and trams, especially on route 55 but also on route 19. More buses on route 505 won’t really help people coming from the CBD and elsewhere on the PT network (the route doesn’t actually connect with any trains except at Royal Park, but could improve connectivity from some local suburbs, and changes could be considered as part of bus route reform in the area. Maybe the Zoo is already lobbying for these changes, but it’s not obvious. Every time information about their efforts comes out, it’s all to do with roads and cars. Admittedly I haven’t looked at cycling options. What other changes would improve things for Zoo visitors and staff so they don’t have to drive? 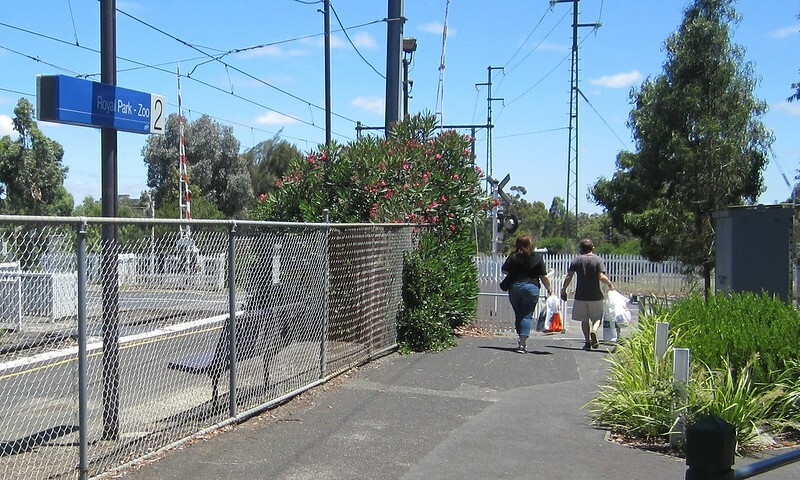 The upfield bike path runs along the railway line providing good access. Maybe a new bike share station would help access from the city? Very comprehensive and convincing post. I think the main client of the zoo is families with young children. This means carrying a lot of cumbersome things like prams, nappy changing bags and food. And of course, feral kids. Having been in this situation, I can understand why people use the car. Improving PT won’t convince these people to catch the train/tram. BTW, the State Hockey/Netball centre has loads of free parking around the back of the zoo, about 5 minutes walk from the zoo’s rear entrance – not sure why zoo customers don’t use this. I think another important factor is marketing. 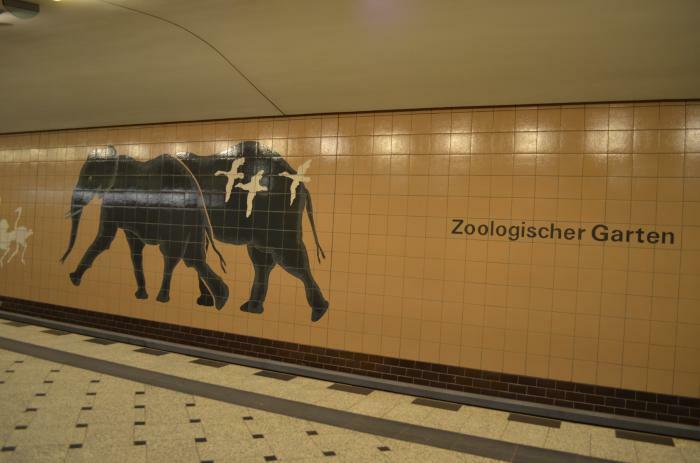 If they had any sort of marketing encouraging people to catch the train to the zoo, it would serve to promote not just public transport but the zoo itself. There was a missed opportunity with the roll-out of the new PTV train network map. The only points of interest labelled on the map are Melbourne Airport, Flemington Racecourse and the Showgrounds. The latter two only because the train stations are named for the landmark. It would be quite easy to include any number of train-accessible landmarks on this map: the zoo, the MCG, Melbourne Park, Caulfield Racecourse, Scienceworks, etc. Hmm, a pedestrian signallised crossing, that only changes once every 20 minutes. No wonder people ignore them. How many times do you stand on the side of the road, and wait and wait and wait, and there are no cars coming for hundreds of metres in either direction, and then, after two minutes, some cars appear, and then the light changes right in front of the cars ? A really good post about how simple things can make a big difference. I think cost is a factor – really cheap parking vs about $25 for a family of four on public transport. If the zoo was closer to the city (and it is pretty close anyway) it would be more of a no-brainer to take public transport due to the cost. I’m sure there are other things that could be done with some lateral thinking – e.g. some kind of deal with zoo membership for cheaper public transport if you touch off at Royal Park station. Agree with Comment 2. With a young family it is much easier to take the car and load the pram in! The point about cheap parking is spot on, at $2 for five hours versus the cost of taking the train the car wins hands down and always will. Is this decision on car park pricing made by council or zoo? The other disincentive is the removal of the cheaper weekend tickets, I wonder if the removal of the Sunday Saver contributed to less patronage on PT? Good post Daniel I noted similar issues in a tweet at the time of that article. Sorry for my long response. As a minimum if new parking were built they should increase the price to get cost recovery of the capex. Re: the station ped (zebra) crossing I would construct it 30m (4-5 cars storage) south of the railway crossing to avoid a need for it to be signalised and synced with the boom gates. Route 55 to the zoo is confusing. There are 3 tram stops variously accessible to the zoo. Stop 23 at MacArthur Road serves the Zoo’s southern entrance, Stop 25 is actually called Melbourne Zoo and serves the main northern entrance but feels like its the middle of nowhere and Stop 26 is at the train station and as close to the northern entrance as Stop 25 is. (Stop 24 is for the Netball and Hockey Centre but also adjacent the Zoo wall likely confusing some people). 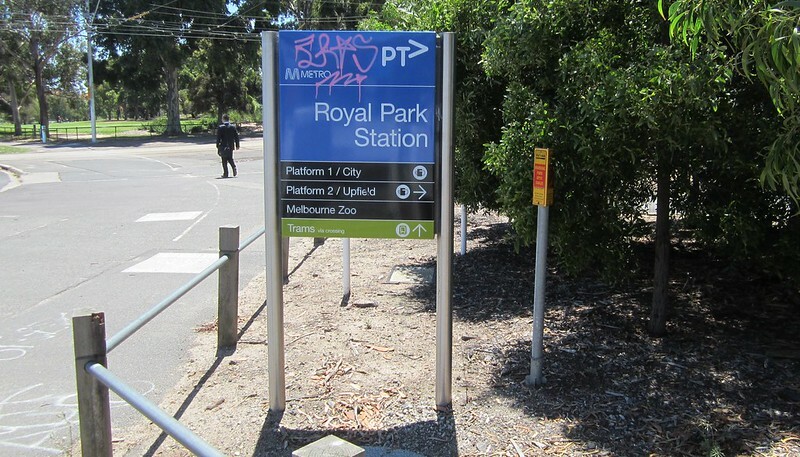 If it was me I would delete stop 25 rename Royal Park Station and Tram Stop 26 as “Melbourne Zoo” and from the main entry be able to point everyone in one direction to “Public Transport” with upgraded crossings, information, wayfinding as you’ve pointed out. One problem with this is that Stop 26 is west of Poplar Road and the western footpath of Poplar Road doesn’t have a crossing of the train line to access the zoo!! So if you do get off a tram at stop 26 and want to go to the zoo you either have to cross the tram tracks on the traffic lanes or cross Poplar Road twice with no priority. Having seen the queues that form at the zoo perhaps one way to encourage public transport would be an express lane for public transport users somehow connected to Myki? Re: Cycling your points about crossing of Poplar Road (near the station) are as true for cyclists as pedestrians. 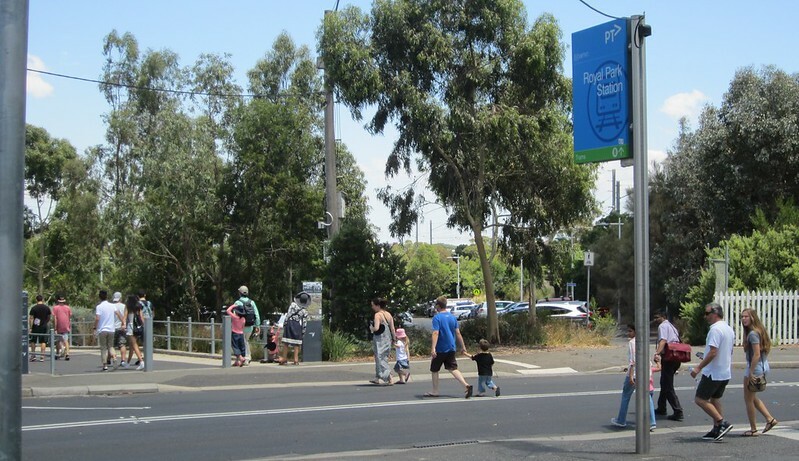 Royal Park Station is a confluence of bike tracks with the Capital City Trail/Upfield Bike path (which merge about 1km east) crossing a path that follows the tram tracks through Royal Park all with no priority across Poplar Road. I have ridden to the zoo before and did find bike hoops – but it wouldn’t be hard to remove the 5 parking spaces closest to the entry and install another say 50 bike hoops. There also isn’t a bike share station at the zoo. Probably due to the overall low number/density of bike share stops in Melbourne. The furthest north is at Melbourne Uni. I would have thought an expansion into North Melbourne could make sense with stations at Errol Street, Royal Childrens Hospital, Princes Park, and Melbourne Zoo spots all with enough daily visitors to be worthwhile (especially considering the low usage of existing stations). Daniel, while your ideas are exemplary, getting a family with 2 or 3 young kids to the Zoo on public transport can be a nightmare, particularly if they have to change from bus to train to tram etc. Going by car is by far the preferred option for them. Royal Park is huge, so I don’t really think they’ll miss the space required to park an extra 1,000 cars. Point taken on the preference to drive when you’re taking kids and all their equipment. But that’s not absolute. As you can see from the photos, plenty of people can and do go to the Zoo with their kids on public transport. The same (but moreso) applies in other cities’ zoos, and also to Melbourne attractions like the Myer Christmas windows in the City. People will choose public transport if the driving options aren’t convenient and PT is good enough. All of this just means the public transport option needs to be easier; more seamless. I have to also disagree with all the comments about kids and PT. My 1 & 2 year old (so nappies, milk bottles etc) love the tram and trains, and it’s an ordeal loading them in and out of the car, especially by yourself. Instead with a double pram it’s clip kids in and roll out. No circling for parking at destination, then unloading/reloading pram etc. The problem is the double is absolutely impossible to fit through the doors of any high floor tram, so many routes are excluded. Even the single most ram can be tricky. Trains are usually fine, but the hopeless Upfield frequency cruels that option (especially if you are connecting to it). Regarding ticket pricing, kids are free until 5, so all that’s really needed for price parity for many families compared to car is raising the ridiculously cheap car parking to around a daily myki cost. I agree. When I was a child, our trips to the zoo were always via public transport, and as an adult, I’ve taken countless small children to the zoo in the same way, some just babies in prams or pushers. For children who get driven absolutely everywhere, the public transport trip itself is part of the adventure. The children I took to the zoo were always thrilled by it, and at the end of the day would chatter excitedly to their parents about riding on the train or tram. When we went by train, we usually changed trains at Parliament Station so that the children could ride up and down the giant escalators. I’m sure these are fairly humdrum to people who commute via Parliament every day, but to small children who’ve never seen anything like them, they’re a novelty, and great fun. Like a fairground ride, but without the cost. * How many connections do you need to make? Changing once in the CBD, or at North Melbourne Station, is no big deal. Change more than once, and it can be a hassle. * How long do you need to wait for a connecting service at each change point? The 20 minute or longer frequency on the Upfield line is a problem. It might be less so at the zoo end, where you can linger at the zoo while you wait, especially if there were a PID inside the zoo gates saying how long it is to the next train. It might be less so in the CBD, especially at Parliament with the aforementioned giant escalators. But at somewhere like North Melbourne Station, with inadequate seating at busy times, and nothing to do, it’s a very boring wait. * How far do you have to walk to get to the first leg of your PT journey? The page on the Zoo website that purportedly helps you get there by public transport contains only a lazy link to the PTV Journey Planner. Nothing about which gate you’ll arrive at, or walking distance, or directions, or likely ticket costs. About the least helpful ‘how to get here by PT’ page you’ll ever see. Agree with most of this. 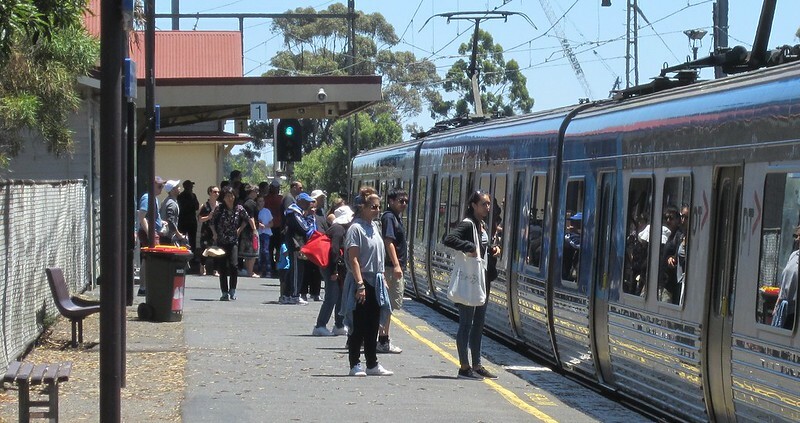 Although it is important to remember that public transport is a network, so even just improving the Upfield line isn’t really enough to make the place easier to access. Improving the Upfield line from every 40 mins on Sundays is helpful, but as long as all the lines in the north/west run have that frequency, the same problem exists. Same with interpeak frequencies. If stations are hard to access with connecting buses, plagued by low frequencies and poor train-bus timing, it is still hard to access. Improving the Upfield line is a very much a key part of the equation, but if all the lines in the north and west, and the outer east and south east are infrequent, the trip is still difficult to make, and driving will continue to be a much easier option. Public transport has to be a whole network solution. It certainly helps to have a frequent service to the Zoo from Flinders St, but if you have to take an infrequent service to get to Flinders St in the first place, the benefits are not fully realised. If the carparking is always full, maybe the zoo should look at restricting the parking for zoo patrons only. Not sure if it’s still happening, but the monash parkville campus students used to park there all the time. Being a campus of over 1000, even if only a small percentage of them park at the zoo, that’s a lot of spaces taken from zoo customers. If Sydney can build a moving walkway like this to access a… carpark!, and a chair-lift gondola ride (included in zoo admission) to get visitors form the ferry what to the main gate to the Zoo at the top of the hill – then Melbourne can build some infrastructure go get people arriving by tram/tram to the zoo. On the Upfield line frequency, a turnback at Gowrie is planned as part of the Metro project, so this could be brought forward to make increased frequency easier (if there was a willingness to do so). Chatting to the people on a Metro stall last year they suggested that we still wouldn’t see better frequency until Sunbury trains are taken out of the northern loop with Metro, but as you note there was already the 2015 plan so it seems to be more a lack of will than genuine impediments. I’m lucky enough to live near Moreland Station, so the train is an easy option for us and our zoo memberships get quite a workout. Even then, if we go on a Sunday morning it’ll often be in the car since 40 minutes is just too long a wait when wrangling our 4 year old out the door makes our departure time too unpredictable. What’s the plan to remove and replace *all* of Melbourne’s high-floor trams? These things are a disability and usability nightmare from the 1980s and beyond, and it’s simply unacceptable that they still predominate. @Dave, thanks – as I understand it, some other Zoo members/patrons have contacted them, and in fact the Zoo has been in touch with me about it. I went to the zoo for one of their ‘Zoo Twilights’ last year via the train. As I live near Macaulay Station on the Upfield line, getting home should have been a cinch. Alas, the concert that night happened to be perfectly timed for everyone to miss the city bound train by a couple of minutes. It was a fairly full platform waiting half an hour for the next train! Perhaps in lieu of PTV improving frequency of the evening services on the Upfield line, the Zoo could arrange with PTV to have an ‘event’ train leaving the zoo toward the city shortly after their concerts. Took my 6-year-old to the zoo today… and we took the train (after I gave her the choice between car and train. To merge a couple of recent posts together (and a bit tongue in cheek), I was disappointed my train didn’t go directly from West Footscray to Royal Park, as per the train network map. However being able to change trains without changing platforms at North Melbourne was OK – only a 10 minute wait. Agree on the lack of signage pointing to the zoo. Apart from the road crossing, there is a zebra crossing right through the carpark to the entrance – just need to extend it to the road! A zebra crossing would be fine – issues with cars stopping on the level crossing could be solved by having a red light on the approach side just before the boom gates come down. The tram crossing of the road also doesn’t have any lights, etc. – surely needs some traffic management treatment there. Agree with the comment on the zoo map – even mentions the bus. Some real-time departure information at the zoo exits would be good. Just a bit off-topic: I don’t catch trains all that often at North Melbourne these days, but noticed that the summary departure information now includes trains to Laverton and Watergardens – previously it only had Sunbury (and I assume Werribee), so if the next train on the Sunbury line was only going to Watergardens it wasn’t reflected on the summary board. Good that’s fixed! I don’t agree more expensive parking is the answer, and the reason is in your blog: public transport there is crap. Even crappier on weekends when many families visit the zoo. 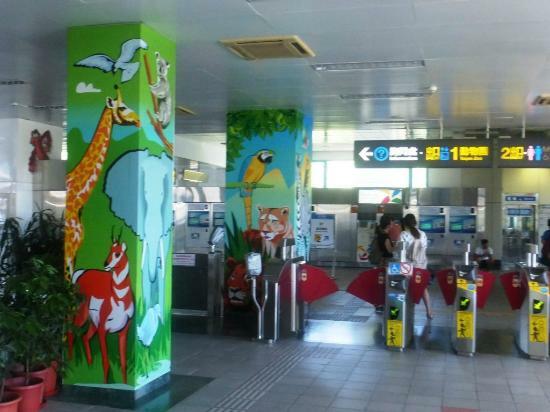 The cost of public transport for a family trip to the zoo and back home will be $25+. If you live on the wrong side of town for the zoo, then it may take well over an hour to make all the connections on a Sunday. Not a great experience for tired young kids or their parents. The convenience and lower cost of a car wins, and taxing the car trip by increasing the cost of parking doesn’t address the convenience factor. The answer is of course to improve public transport connections there, not just at the entrance to the zoo but all along the route. However, this is hardly likely to happen in Melbourne in the foreseeable future. So as someone who has driven around the zoo car park looking for a place to leave the car, in Australia’s fasting growing state capital, I’m for increasing the amount of parking even of it does come at the expense of some parkland. Zoos perform very important social, environmental and educational functions, so it is really important to keep the barriers to getting there as low as possible. These folks comparing the $25+ cost of public transport, to the zoo, compared to $2 for parking at the zoo, must be getting their petrol for free ? @DD : weekend and public holiday all-day public transport fares are capped at $6 per adult and $3 per concession/child (up to and including age 18). You could take 2 adults and 4 children and still pay less than $25. Agree with all those saying public transport to the zoo with young kids and pram is not difficult. I did it numerous times myself. Just load whatever is needed into the pram and onto the train and off at the other end. Easy. Sometimes we think things are more difficult than they actually are. Then again, we were fairly light travellers even with kids, so if you want to take everything bar the kitchen sink you are probably never going to find it easy to use public transport. Granted this blog is about car-parking, and therefore Melburnians getting to and from the zoo, but no one has mentioned tourists! Offical Yarra Tram maps have the zoo represented (Route 55; but not Route 19). PTV doesn’t have any mention of it (not even the new map). #Fail. So if you are a tourist you may assume Tram 55 is your only option. If said tourist grabbed their phone and used Google Maps they would get a better idea of the options, fine. Which begs the question how relevant are physical maps these days anyway. I have always purchased offline metro map apps for O/S cities. I think it would be a win for the Zoo if they ‘themed’ some of the city terminals (and other busy tram stops) with zoo paraphernalia. Even if the PIDs for route 55/19 had “next 55 (Zoo) in 6 mins”. This could also be spread across other PIDs for other tourist attractions “next 48/75/70 (MCG)”; Aus Open, Melb Museum, Luna Park, A-League GF. And, trains could could easily do the same “Royal Park / Zoo”; Jolimont / MCG”. Has been a while since I last visited that area, even longer when I was last inside the zoo. Looks like not much has changed. As part of my TranzitJim Vision website, I am pushing for a new #68. A shorter length, but all week version of the old #68. Use D2s based at Moreland, between the city and Royal Park R/S, mostly to improve access to the hospital district. Once upon a time, the Upfield line, had every second train terminate at Gowrie. That should be easy enough to do again today. While An Upfield terminator is at Upfield, turning around at Upfield, you can have the same happening at Gowrie too. Even if you need the Gowrie train to shunt forward onto the existing single track for its turnaround. Re, the Low floor trams. I object to the current focus to allocate all E class trams to the same two depots. Making a tram route all E class before going onto the next one. I feel, we need them to be more spread out across the network. Use low floor trams as the base frequency trams across more routes, and use the high-floors to supplement the frequency such as in peak hour, until all of the High floor trams get replaced.